اسلامی, روح الله. (1395). پدیدارشناسی صلح در اندیشه انقلاب اسلامی ایران. اندیشه سیاسی در اسلام, 3(9), 7-34. روح الله اسلامی. "پدیدارشناسی صلح در اندیشه انقلاب اسلامی ایران". اندیشه سیاسی در اسلام, 3, 9, 1395, 7-34. اسلامی, روح الله. (1395). 'پدیدارشناسی صلح در اندیشه انقلاب اسلامی ایران', اندیشه سیاسی در اسلام, 3(9), pp. 7-34. اسلامی, روح الله. پدیدارشناسی صلح در اندیشه انقلاب اسلامی ایران. اندیشه سیاسی در اسلام, 1395; 3(9): 7-34. با ظهور انقلاب اسلامی در ایران ادبیات سیاسی جدیدی در اواخر قرن بیستم با عنوان ورود اسلام سیاسی به عرصه عمومی به وجود آمد. بازنمایی انقلاب اسلامی با رویدادهایی چون گروگان گیری در سفارت آمریکا، جنگ هشت ساله، حمایت ایران از حزب الله و حماس، طرفداری از جنبش‏های اسلامی، نفی اسرائیل، نقد غرب و سرمایه داری، ضدیت با رژیم های استبدادی عربی، تلاش برای ناکام گذاشتن آمریکا و ناتو در خاورمیانه، نفوذ داشتن در عراق، افغانستان، لبنان، سوریه و فلسطین، حمایت از انقلاب در یمن و بحرین و ... چهره‌ای خشونت طلب، جنگجو و تروریست از ایران در اذهان منطقه و جهان شکل داده است. این پژوهش سعی دارد با تعلیق آگاهی، شکاکیت و فرا رفتن از قصدیت های قدرت در منطقه و جهان به تفسیر و تحلیل جهان زیست اندیشه انقلاب اسلامی که ریشه در سنت ایرانی اسلامی دارد، بپردازد و نشان دهد که رگه های صلح طلبی، آبادانی، مشارکت مردم و گرایش به امنیت و ثبات در سازه ها و ساختار سیاست ایرانیان بعد از انقلاب وجود دارد. برای این منظور با استفاده از روش کیفی پدیدارشناسی و با ارجاع به متن قانون اساسی و درآوردن پدیدارهای اسلامی، شیعی، انقلابی، ملی و انسانی به واکاوی صلح خواهی ایرانی خواهیم پرداخت. With the advent of the Islamic Revolution in Iran in the late twentieth century, a new political literature as the emergence of a political Islamic trend Came into existence. This movement characterized the representatives of the Islamic Revolution with events such as hostage-taking. In American Embassy, eight-year imposed war, Iran’s support for Hezbollah and Hamas, Advocacy of the Islamic movements, rejection of Israel, criticism of the West and the capitalism, anti-authoritarian Arabic regimes, efforts aiming to abort activities planned by America and NATO in the Middle East, having influence in Iraq, Afghanistan, Lebanon, Syria and Palestine, endorsement of the revolution in Yemen and Bahrain and other involvements has projected a violent, warrior, and terrorist image in the minds of the region and the world. 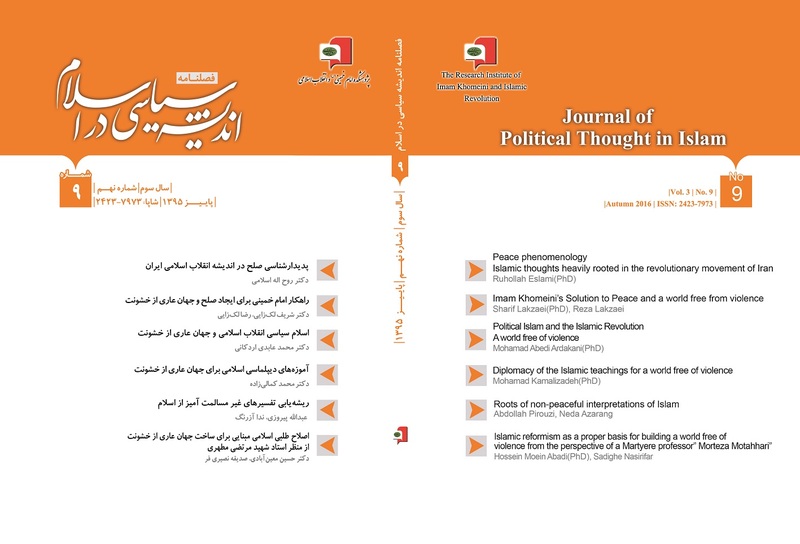 This research is trying to analyze the life world of the Islamic thought heavily rooted in the revolutionary movement of Iran through eradicating the propaganda, false awareness, skepticism and going beyond the intent of power in the region and the world to interpret and analyze the life-world of thought attributable to Iran’s Islamic revolution rooted in Iranian Islamic tradition. This eventually demonstrates the streaks of peace, prosperity, people’s participation and attitudes to security and stability in the systems and the structure of Iranian politics after their revolutionary movement. For this purpose, using Phenomenology as a qualitative approach and by reference to the constitution and removing the Islamic, Shi’ite, revolutionary, national and humanitarian phenomena, we will re-analyze the Iranian national peacemaking efforts. اسلامی، روح اله. (1394). سیاست به مثابه تکنیک. تهران: خرسندی. رشیدیان، عبدالکریم.(1384). هوسرل در متن. تهران: نی. سعدی، مصلح الدین .(1377). بوستان. تصحیح محمدعلی فروغی. تهران: رجبی. شریعتی، علی .(1390). علی حقیقتی بر گونه اساطیر. موسسه بنیاد تحقیقاتی دکتر علی شریعتی. فردوسی، ابوالقاسم. (1389). شاهنامه. تصحیح جلال خالقی مطلق. تهران: بنیاد دایره المعارف بزرگ اسلامی. ج8. فیرحی، داود. (1393). دین و دولت در عصر مدرن. تهران: رخدادنو.ج2. مطهری، مرتضی. (1362). خدمات متقابل اسلام و ایران. تهران: صدرا . ملایری، محمد. (1375). تاریخ و فرهنگ ایران. دل ایرانشهر. تهران: انتشارات توس.ج 2. هابرماس، یورگن. (1388). ایمان و دانش. ترجمه فرزین بانکی. تهران: انتشارات دانشگاه تهران. هایدگر، مارتین .(1386). وجود و زمان. ترجمه محمود نوالی. تبریز: موسسه تحقیقاتی علوم اسلامی و انسانی دانشگاه تبریز. هوسرل، ادموند .(1381). تاملات دکارتی. ترجمه عبدالکریم رشیدیان. تهران: نی. Arjomand, Said Amir. (1988). the turban for the crown, The Islamic revolution in Iran: oxford. Axworthy, Michael. (2013). revolutionary Iran. London: penguin book. Ehteshami, Anoushiravan& Mahjoob, Zweiri . (2008), Iran’s Foreign Policy from Khatami to Ahmadinejad, Published by Ithaca Press. Honarbin, Mehri..(2010). Becoming Visible In Iran Women In Contemporary Iranian Society.London AndNew York: Tauris Academic Studies. Hunter, Shireen T. (2010). Iran’s Foreign Policy in the Post-Soviet Era, Resisting the New International Order. London: Praeger. Marschall, Christin. (2003) .Iran’s Persian Gulf Policy From Khomeini To Khatami.Usa And Canada By Routledgecurzon. Ramazani, R.K.(2001). Reflection of Iran’s foreign policy: Defining the national interest. in the book: Iran at the crossroads- edited by John L Esposito and R.k Ramazani. New York, Palgrave. Ramazani, R.K. (2008). Iran’s Foreign Policy: Independence, Freedom and the Islamic Republic. in the book: Iran’s Foreign Policy from Khatami to Ahmadinejad. Edited by Anoushiravan Ehteshami and Mahjoob Zweiri, Published by Ithaca Press.pp 1-17. Ricks, Thomas M. (1992). Power Politics And Political Culture Us-Iran Relations. In The Book: Iran Political Culture In The Islamic Republic Edited By Samih K.Farsoun And Mehrdad Mashayekhi. London And New York: Routledge. Roy, Olivier. (2007). the failure of political Islam, tranclated by Carol Volk. Newyor. Harvard College.